Dynamite proudly presents this exclusive cover by Bob's Burgers artist Maggie Harbaugh! 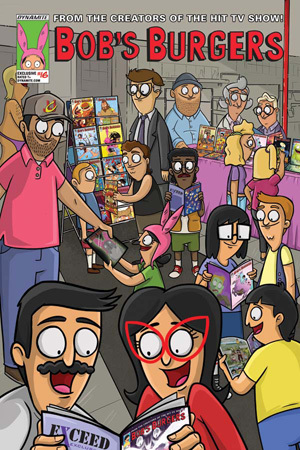 Gene, Louise, and Tina share a spooky story of a burger gone bad in issue #16 of the Bob's Burgers Comic Book! Bob prepares a burger with a strange spice, but when a hungry Gene reaches for it and pricks his finger, the kids find out that it's the burger that's hungry - for blood. As it grows and brings great success to the restaurant, the kids have to decide whether to continue to feed the burger, or fry it. NOTE: Limited to only 500 copies. Allocations may occur.